Joe Jackson Is she realy going out with him? A splendid NOTP evening prepares us for the next 30 years! It only took a quarter of an hour and we had already heard a gentle introduction by Scala, scattered across the hall. Fernando Varela had sung the original Marco Borsato ‘Verita’, Basement Jaxx had played the samba and we had started to waltz. Oh my god? Most definitely not! The crew surely had thought this through. Before the break we saw every headliner (except for Joe Jackson, Regi and John Miles) starting off at an easy pace. After the break we had the real NOTP feeling: unexpected turns of events, the tempo got higher and then all of sudden a moment of pureness, of intimacy with Joe Jackson. And in the end fireworks with John Miles, Regi and all the others. From the moment we met her, we fell in love with the beautiful Alexandra Arrieche. Il Novecento was in perfect shape and Alexandra showed her skills, made some jokes and worked nicely together with the artists. A major congratulations to you, Alexandra. You have a different style than the fantastic Robert Groslot and we already love it. Fernando Varela showed us that it is absolutely possible to grow during a concert. What a magnificent voice. His `Nessum Dorma´ convinced everybody and the V`ivo Per Lei´ was superb. And who knew he was such a performer? 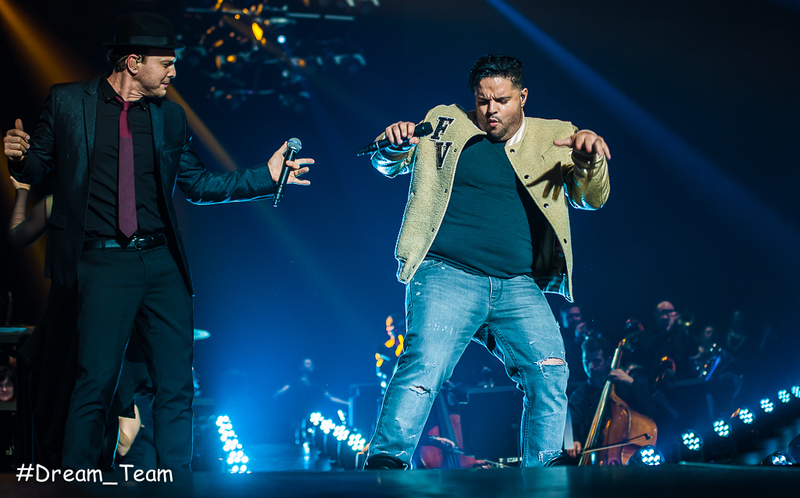 What a show in `Uptown Funk´! And those shoes with his initials in gold: gorgeous! Big discovery: Gavin Degraw. You might say Gavin Who, but the ‘younger’ audience knew him immediately. His voice is special and his songs are beauties. Gavin, the more you performed, the more the audience cried for you. Scala: we know Scala as a technical perfect choir and a beauty to watch. We didn’t see some replacement act for Fine Fleur, no, absolutely not. We saw an artist who opened the Proms magnificently, demanded a well-earned spot on the podium, sang a heavenly `With Or Without You´ and who just has to come back next year(s). And then we had Natalie Imbruglia on stage. She started with `Torn´, her biggest hit and continued with `Instant Crush´, a cover from Daft Punk. That’s how fast 20 years of music pass, but Natalie stays young and her performance is top level. We almost forgot to mention it, but the lighting was again magnificent. Light screens and spots floated everywhere, not easy to control all these things. Well done, technical crew! And with all those lights you couldn’t miss them: Basement Jaxx. A golden and cloudy duo who were ready to swing. The tempo and the show went up with `Red Alert´ and `Romeo´. Ladies and gentlemen, thank you for your amazing show. Your positive vibrations were absolutely there! In the meantime we saw a hard-working Kobe Ilsen, the new host. Although his voice still needs some training, he surely got the crowd moving. Kobe is the face of the younger Night of the Proms and we saw him everywhere. On the podium and even on a `Wrecking Ball´ to perform John Miles and his cover of Miley Cyrus. Mr Proms, we had to wait for you until the very end, but you again were worth waiting for. There is no superlative to describe how good you are and how much we love `Music´. In the end we also had the intimate Joe Jackson. No real performance, just beautiful songs. Even the noisiest in the Sportpaleis went silent. Joe was what the others weren’t. His singing brought peace and calmness and were a moment of tranquillity before the big finale. Joe, respect. The classical pieces were well chosen outstanding songs. Antwerp and Rotterdam don’t have that much classical parts anymore, but what they have, is quality. Regi, dance music, all the artists, party, Uptown Funk, fireworks… now that’s what I call a grand finale! Good show! We absolutely loved this evening with the New Night of the Proms. Well done, Jan and your entire team. And thank you for the return of the goosebumps while writing this article. 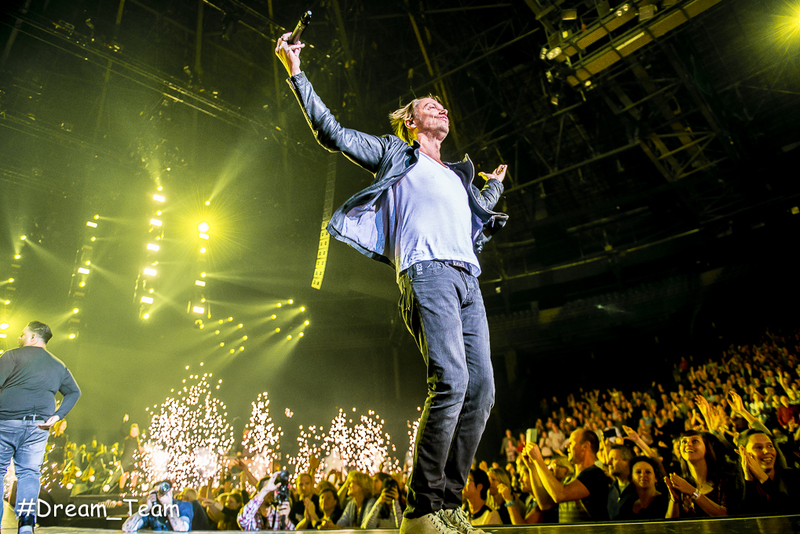 Am Freitag, den 13.11.2015 wurde die Premiere der Night of the Proms in Antwerpen zelebriert. Viele langjährige Freunde der Night of the Proms waren von den zahlreichen Neuerungen in Antwerpen im Vorfeld überrascht. Neue Orchesterleitung, neuer Chor, neue Backgroundsänger/-innen, neuer Moderator,... alles neu im Jahr 2016 in Belgien. Umso mehr zog es uns zur Premiere nach Belgien. Auch 2015 gab es keinen herausragenden Top Act, sondern die Show in Gänze und besonders das fulminante Finale wurden gefeiert. Der Chor Scala begann mit Natalie Imbruglia und dem wunderschön inszenierten Main Titel aus dem Film `Die Tribute von Panem´. Ein prächtiger Auftakt 2015! Danach wirkten die wunderschönen Damen eher unnahrbar und kühl. Ihre großen Welterfolge `Creep´ und `Black horse´ wurden im Line-up nicht berücksichtigt. Dafür gab es den sehr ruhigen U2 Klassiker `With or without you´ und den modernen DJ Regi Houstrack `Elegantly Wasted´. Gut! Luxembourg, Holland und Deutschland dürfen sich auf den Classic Act 2015 freuen. Fernando Varela ist ein begnadeten Tenor aus den Staaten von Amerika. Sein `Nessun Dorma´ wurde wahrhaft zelebriert. Standing ovations! Die weiteren Werke waren eher ruhig und auf Benelux abgestimmt. So ist der Song `Verita´ ein Megahit für den niederländischen Künstler Marco Borsato gewesen (siehe Video zu `De Waarheid´). In Deutschland ist der Song eher unbekannt. Die Songauswahl machte es Fernando nicht möglich, ein gefeierter Tony Henry (Proms 2006) zu werden. Dazu fehlt ein `You Raise Me Up (Por ti sere)´, ein `Caruso´, ein `Granada´ oder auch seine oftmals dargebotenen, modernen Konzertwerke von Coldplay oder Peter Cetera. Nichtdestotrotz, ein wahrer Glücksgriff für die Proms! Ein weitererer Bühnengast 2015 war Gavin DeGraw. Er ist ein amerikanischer Sing & Songwriter und hatte das Publikum fest im Griff. Seine drei, in Deutschland eher unbekannten Hits, und besonders seine aktive Bühnenshow wurden intensiv gefeiert. Besonders sein Song `Not over you´ überzeugte ohne Einschränkung. Natalie Imbruglia lieferte ebenfalls ein Top-Leistung auf der Bühne in Antwerpen ab. Ihr Songs sind, wie ihre Schönheit, weiterhin zeitlos. Wenn Sie nur noch einen weiteren Megahit in ihrer Karriere gehabt hätte! Zudem stand das britische Electronic-Dance-Music-Duo Basement Jaxx auf der Bühne. Die Damen gaben ihr Bestes und das Publikum saugte die wahrhaft glitzernde Show auf. Unser Geheimtipp zündete nicht und wir erlebten keine imaginäre Rückkehr der Pointer Sisters in Gestalt der Sängerinnen von Basement Jaxx (Pointer Sisters Flashback 2.0, Video). Eine Veränderung gab es, wie angekündigt, im Bereich der Moderation: Der bisherige Gastgeber der Proms Carl Huybrechts, verabschiedete sich nach 30 starken Moderationsjahren von den belgischen und niederländischen Proms. Der Staffelstab wurde leider nicht aktiv auf der Bühne übergeben. Die Show wurde vom neuen Moderator Kobe Ilsen geleitet. Er arbeitete hart und fleißig an diesem Abend. Ein guter Start! Nach Amy Winnehouse 2011 nimmt sich John Miles dieses Jahr erneut einen modernen Song vor. Dieses Jahr ist es der Welthit `Wrecking ball´ von Miley Cyrus. Und: Es funktioniert!!! John Miles rockt die Halle und es ist eine Wohltat zum Auftakt des fulminanten Abschluss!. Leben kehrt in den Sportpalais zurück! Zum Glück konnte Veranstalter Jan Vereecke noch DJ Regi im Herbst für die Proms verpflichten. Sein Party Mix mit teilweisen, extremen Housetracks (z.B. der Remix `Heads Will Roll´ von Yeah Yeah Yeahs) zum Abschluss, ließen die Konzerthalle beben. Ein geglücktes Experiment. Chapeau vor diesem Wagnis!